A continuous batch system employing a high-speed rotor-stator configuration to shape platey and cubical particles, usually to improve fluidity. Typically works in the microns and sub-micron range of particles suspended in a media, usually water. Integrated motor rotor assembly eliminates coupling. Standard 150 hp, VFD available. Mounting can be either vertical or horizontal. Delamination requires a gentle and focused cleavage of plates from cubical minerals. Working at the 2.0 - 0.5 micron range, a special media and impeller action provides the low intensity impact required to produce cleaving without then breaking the freed plates. Twin-cell configuration ensures high yield of plates from "booklets"
Internal screen retains media in the chambers without fouling. Rugged gear-box drive coupled to a belt drive allows precise speed, intensity for specific applications. Unique tapered coupling maintains alignment. 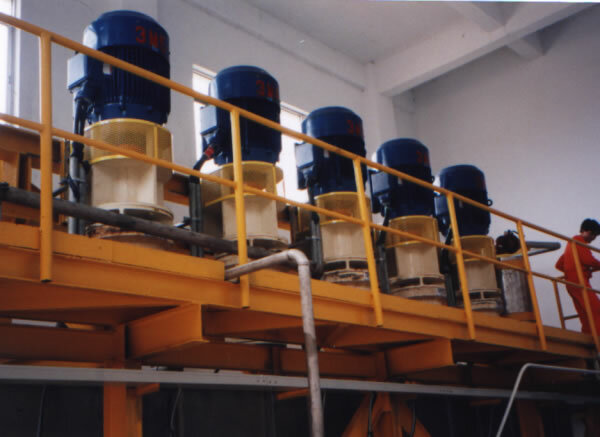 A continuous, dry pulverizer / classifier capable of reducing granular or beaded materials to 7.0 Hegman powder. The milling rotor, composed of multiple rows of fixed hammers turning inside a corrugated housing, is followed by a separately-driven variable speed vane-type classifer. Rugged construction and effectiveness proven by multiple installations continuously in use for +30-years. Current models incorporate the most recent technology in bearings, materials and design. Flexibility in design and set-up after installation is available to suit specific requirements. Rugged 150 hp, belted main drive, with 20 hp classifier direct drive. Feed-rate regulated by a main-drive power demand controller. High-chrome alloy corrugated milling liners. 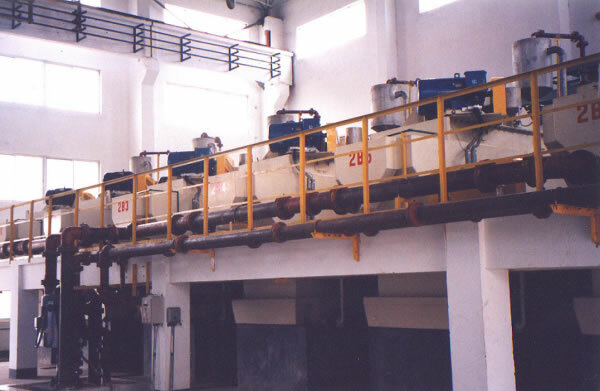 Pulverizer hammers of heat-treated SAE 4150 alloy. Fixed speed, finger (or "whizzer") type, blade bodies of SAE 4150 alloy with tungsten carbide tips. Independent, variable speed turbine of AR360 steel. Safe and ready access to wear parts facilitate replacement.